Close your eyes. Picture yourself at the 2000 MTV VMA's with Britney Spears singing Satisfaction/Oops!…I Did It Again." How about the Gilmore Girls premiere? Or flash forward to 2003, when you were glued to your TV watching The O.C. In the early 2000's, we were gifted with talented hits like the Remix to Ignition by R. Kelly, Drop it Like It's Hot, Seven Nation Army, William Hung, Vitamin C, the list goes on. Justin Timberlake waking up one morning and thinking, 'Hey, you know what would be a good look for me? CORN-ROWS'. Britney Spears rocking pig-tails, a crop top, platform trainers, bunches and a headset microphone to mime into. Now open them, turn on your radio to Ms. Jackson by Outkast from 2001, and get ready to Get Ur Freak On and THROWBACK to the early 2000's! 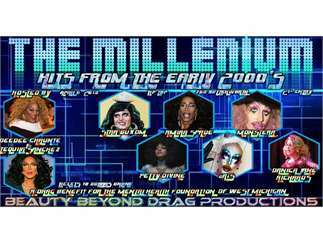 Millenium: Hits from the Early 2000's - A Drag Benefit for Mental Health. The Mental Health Foundation of West Michigan is a go-to source for mental health education and awareness with the overall goal to create communities with good mental health. The mission of the Mental Health Foundation is to create communities that have good mental health by inspiring people to recognize, understand, accept, and take action. They help individuals with mental health issues, so now it is our turn to help them! SHOWTIME IS 9PM. DOORS OPEN AT 8.